We had a wonderful day at the Huntsville (Ala.) "Tanical" Gardens, as 3 1/2-year-old grandson Capt. Adorable says. 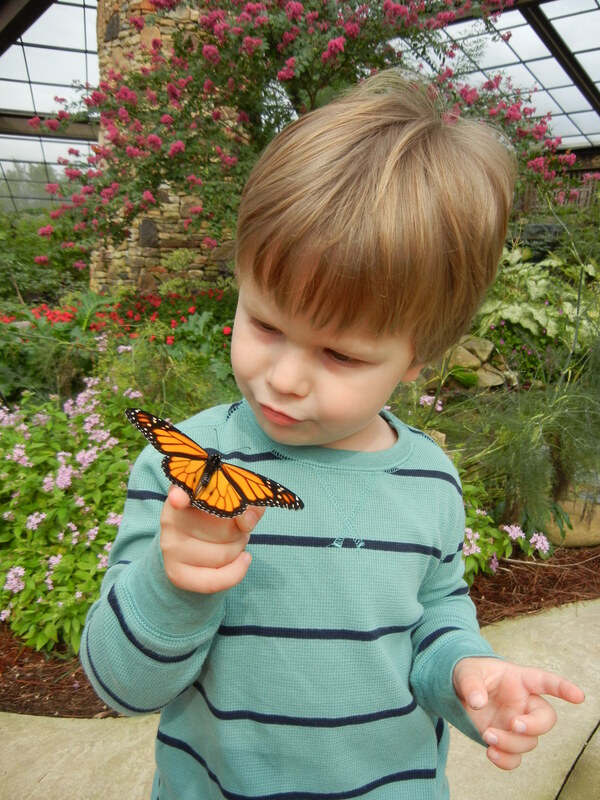 The Butterfly House is his favorite, and his mom has trained him well in the delicate art of putting sugar-water on your finger and being patient. Of course, he still runs around yelling, "Hey, butterflies! Come get some food!" And he forgets all about the concept of a light touch by the time he gets to the box turtles. But still. This entry was posted in Alabama, art, family, TV and tagged Butterflies, Butterfly, Butterfly House, day trips, gardens, grandchildren, Huntsville Alabama, Huntsville Botanical Gardens, Outdoors, recreation, Wildlife by Coffee with Cathy. Bookmark the permalink. Did they have the scarecrow trail up yet? What a gorgeous photograph. It would be quite at home on the covers of several magazines. Beautiful expression! Mary — Yes! They are so cute, too. I’ve got more photos I’ll post. Carolyn — You are too kind! I think we just lucked out with a slow-moving butterfly. Wonderful photo that we just had to share on our Facebook page. Thanks for you kind words in your e-mail and we hope that you continue to visit the Garden.